“So you want to build a plane. Why don’t you build an RV”. “What’s an RV?” I responded. “Well take a walk yonder in that field and there are over 200 you can look at”. These words being spoken at my first trip to Oshkosh three years ago. While walking to the field, I looked up in the sky, and saw a formation of 20 or so planes, smoke trailing. “What are those?”, I asked another onlooker. “Those are RV’s”. Wow….. I thought. I made it to the field and to my amazement, rows and rows of beautifully painted home built planes. I spoke to many of the builder pilots. I remember talking with an older gent. He built his plane about 10 years ago. He told me how he would fly commuting from San Diego to LA and how on occasion, do rolls and loops when he got board. “These things are aerobatic” I asked. “you betcha”.. At that point I was pretty much blown away. Well long story short from that day, my life has not been the same. I am currently building a 9a tip up. I’m almost done with the fuse. 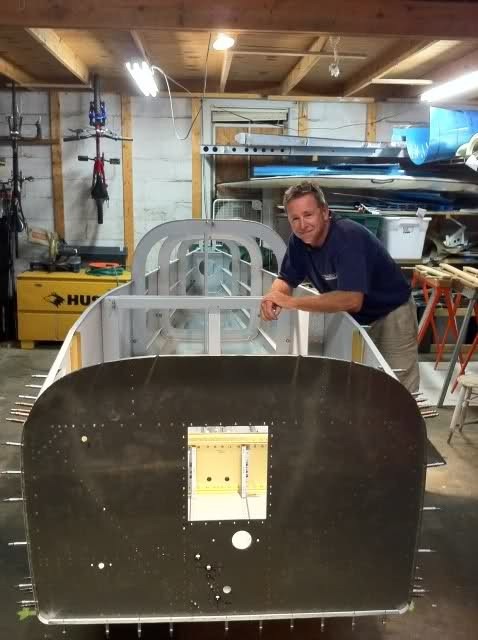 I built my empennage and I am soon starting my wings. I decided to build the fuse before the wings as i wanted very much to get into the meat of the project. I am rebuilding an 0320 with an AP friend , having sent the key parts out to be reworked and certified. I have pretty much been eating and sleeping RV airplanes since my great day at Oshkosh. That’s my RV story. It was great to once again see another gathering of great people and planes in Hartford,CT last weekend. We all gathered to see the original RV-1. Every model of the Vans RV had been proudly shown on this glorious New England day. I took this picture atop of a little building, quickly climbing down the latter when I learned the building belonged to the FAA. Thanks Van for designing and building that RV-1! 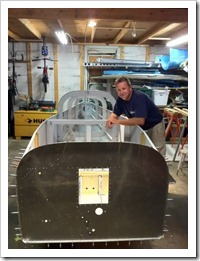 Al’s RV-9A fuselage is looking good – build on !